I put my plein air kit together, watched numerous dvd's of the big guys, purchased the rolls royce of easels and its accompanying backpack in preparation for an artist friend to come over for a plein air excursion in Europe. The trip included places in Belgium and France and The Netherlands and maybe a quick jaunt to Italy. The goal was to have a plein air painting to represent each day my friend was here and to post finished works on this blog... Life takes funny turns sometimes. My artist friend let me know after her first 'wipe away', that plein air painting was not preferred over indoor studio painting, but the day was young so I am still hopeful for a conversion. I needed to see the world in her eyes instead of a long term European resident. To a newcomer, Europe has complicated textures that invite tedious brush strokes and longer producution time than the setting sun allows. Vision is good but fast vision and ability to slap it define one's capabilty int th e great outdoors. My friend, from the point she decided the outdoor work did not match the merit of her indoor work and emphatically revoved any evidence she had succumbed to anything not lookign classically real on her canvas, turned to her passionate interest of photography. In light of our 'discovery' it was hard to set up too many times without guilt. After all it was her first trip abroad and we were excited to see panaramas either with cameras or brushes. I ended up with seven 'starts' in the month. My husband labeled them 'childish-looking' compared to my 'other work'... considering the speed I worked, in an effort to dimish my guilt and selfish activity, I only gave him one left hook. When these works 'mature' out of their ugly duckling phase, it could be amusing to post the starts as well as the finished works. This cannot be done today. The 'afters' are not done'and none are photographed. So hang in there. Visit again and see for yourself if the left hook was justifiable or I must eat humble pie. It's the journey that counts, and posting such comparison are today a side road. Back to our trip It contained many experiences that I am certain will be relived in paintings yet to come. We met the modern-dayDutch Rembrandt in his studio and talked with him at length after viewing his 40-yar retrospective in his museum. We did popular things too like Monet's Garden and surroundings and Richard the Lionhearted's castle. We lingered to snap other landscapes, waterscenes, sunsets before heading into Paris. There, while set up for a street scene, I was spotted by a group of plein air artists meeting nearby before heading for their barge trip in France. I was painting the Joan of Arc statue near the Louvre, which had this gigantic Ferris wheel for a backdrop and wonderful frame for the main story. (The fair comes only once a year, and I found this a pretty lucky view). Another pleasant surprise occured there. When I started the painting it was foggy and it was only later the Eiffel Tower gradually appeared out of he misty background into a day full of sunshine Yes!I think this has a lot of commercial appeal based on my own -want-to-keep-it feeling. There are a lot more famous sites in Paris than this little corner, so I may get to enjoy it for a while before it has a buyer which will be okay.. 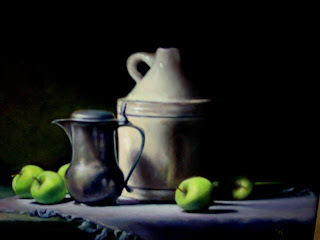 This is the first of a series of still life paintings that include antique objects in the compositions. 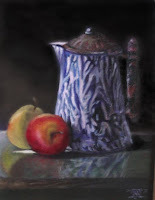 Here is an old ceramic crock and pewter pitcher with everyone's favorite, the apple. These happen to be Granny Smiths, but recently I met someone who is totally enamored with ''Canadiens''. A beautiful fruit many European artists include is the quince. Fruit is a great way to add movement and add color for just the right spot of contrast and focal point. I am drawn toward real antique items, over let's say 250 years old. I find them in travels in Europe: crockery, pewter, French faience, certain tools -- things that have simple shapes and patinized surfaces -- the older the better. I aspire to own something with a bronze patina of turquoise, or a delicate soft irredescent green like in a Roman glass. Recording the evolution of these items is a way to immortalize those rare ones who have made it to our century. I also am looking for romer glasses with the raspberry pontils for better gripping (before utensils were commonly used). I also want to fit objects into my work than make them non-gender specific to the viewing audience. I'm not interested in hunting as an activity, but I've discovered a whole world in duck decoys, their colors, construction and the appreciation of this craft. I visited a museum with 2800 hand crafted examples! In Natchez, I found an oyster knife used on the Mississippi with a beautiful patina on the handle in a local antique shop. Another time I bought a lot of seashells, where just one shell is valued on the internet at 300 Euros, originaly from an island off the coast of India. What fun it will be to juxtapose the items into a nice composition. 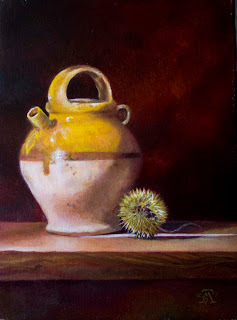 Some artists like to have a thread of symbolism or metaphor while others just want objects in a composition and the viewer to imagine connections as they will. What do you think? I had been working in watercolor and desired to switch to oils. I headed for Florence to take a course in still life. While working on a still life in class with instruction was interesting, I decided to set up another one in my room. After a short time, not accustomed to working from life with natural light, I started to lose the enthusiasm that had shimmered over me upon arrival. During my first solo museum jaunts, in the city, just hours before-- my eyes welled as hairs on my arm had stood on end,when I saw for the first time the marvelous works of art 'in real', that were created where the wonderful Age of Reasoning flourished. I was so inspired that within a short time, a small still life in my room in a beautiful fifth floor walk-up, took shape. I set up near the window with a view of the Tuscan hills and Florence rooftops to amuse me during breaks and hoped to keep similar tempo as the one in class. From lunch to about six I visited museums and sketched in the city. The city took all of my energy trying to see and do everything in one month. I retired each evening exhausted but happy. As with any 'good artist', even those at the artist charm schools, who are wired with the needed bells and tooters, to show their every stroke on the big screen to a packed audience, I succumbed to a common professional hazard. This is what I personally refer to as the ugly duckling stage. Ironically, in a profession that demands acute vision and sensitivity, in the fine art production process, at a particular point, over and over with almost every work, the artist loses both and begins to wonder why the work isn't getting the intended ' look'. Why isn't it progressing? Then we doubt our talent entirely. I spiral into thoughts like why do I stay in this loner solitary work life, what made me start said painting in the first place, and then because I am so used to this-- I work more furiously with the sole aim to paint myself out of this phase. I just work through it from the come-out-fighting corner, and the other end of the spectrum kicks in as my creative spirit to hallucinates to the point I pass the home stretch on this one work and envision my work one day reaching a place of honor in a museum. It is part of the process almost with every painting for an artist no matter what ilk for we have no predictable alphabet or note like other artists depend upon. We commit gracefully each time to a flat spanse of white space and it s challenge. We come back for more, and receive a lifetime of reward for our mental and other sweatas we form our own definition of beauty. Thank you Leonardo for the concept of beauty. Predictably, it was my turn to get through the comtemplation mode with this little still life in my room ...I questioned my prowess and moved on, into the here-I-go-again with 'the process' -- Was the composition too contrived? Was the working? Was there a fibonacci factor or natural spiral , enough harmony, too many colors, not enough? Oh can artists comtemplate things! Were the chosen objects too mundane? too close, far enough apart, justapositioning 1001 my eyes did see. On and one I hammered into my confidence until I built the wall. This is third phase, the danger zone, the artist has to pass through it--like Dorothy at the Wizard's door, we are too far to turn back but still frustrated and yet the answers lie within us the whole time by only taking the risk. However, no matter how I contorted my head, I dinged it with every dong coming out of the distant carillon. My circadian rhythm was shutting all systems down, and just like the setting sun, my eyes were heavy and suddenly before nightfal my body was calling it a day. Then it happened! A little spark of light slowly beamed a narrow chard across the surface of my set up-- between two of the objects like a strip of combustion out the back of a race car it shot with magical illumination. Lovely! I scrambled to mix the chroma needed--the one with the dimmer switch turned up as high a possible and no medium added -- but irritatingly the sun did not wait. Okay, don't be a slave, just wing it and put it in...no wipe off, do again, looks...ok...looks better, oops too much and on it went until the darkeness lead my nose 4 inches from canvas in darkness. I missed it. I had to see this event again to get it and to be ready. I noted the time but for a couple of evenings the city of Florence had activities I couldn't miss and I joined fellow artists to indulge in some incredible lectures. It rained out my light so I missed a session or two, but finally the perfect day fell when the Tuscan sun was again in full force. I made sure nothing and nobody kept me from the hundred steps up to my hot rod window--where I would be on my mark, ready and set with fresh pigment, anticipating a few short seconds that would make my painting cross the finish and excite the crowd. Yes! Perfect timing. Made it --the bravura flick, that would ignite the emotion of its viewer . I got it just as the sun flickered in my room and disappeared behind the hills. This was just what the painting needed. Just as in a portrait, one wants to find the color or a personal characteristic, an event --the nuance that might go unnoticed if not for the constant search to find it. In a painting, likeness is good, but not everything. Technical bravura is not enough. A painting must stand on its own first as a beautiful work of art, say all the experts. Does the modern admirer know what Mona Lisa really looked like exactly? Why does s/he stand for hours to get a glimpse of it? For the sfumato or smokey background ? For her mysterious smile ? To fantasize if Leonardo really did use himself as the model the 15 years he carried it from place to place? Most do not know -- but for sure this work timelessly speaks to the human element--the one that gets us to read book, go to movies, write or relate our experiences to others through the visual. Apologies for the glare on the photo, good news/bad news--it sold before I could re-take the archive. The instructor at the art academy advised me to leave out the reflection in the foreground (it was on a formica surface). What do you think? This is part of a series of still life paintings, depicting objects from the art and antiques collection of Dutch 'n' Duchess Art and Antiques, a web-based business supplying mainly to US dealers. This painting features a water or wine vessel of French origin with a chestnut on patinized wood. The challenge is to first track the marvelous at the markets with scrutiny, making sure the antiques are genuine. My signature item in this series will be a chestnut placed somewhere in the composition to form the basis for a body of related works for exhibition.